On January 24th, Real Steel comes out on Blu-ray/DVD, DVD, and digital download. Our 8 year old son showed a lot of interest in seeing this film when it was in the theaters, but my husband and I thought we should watch it first to see why it is rated PG-13. Since I did not pay too much attention to the press about this film, I did not know what to expect. I knew it had robots in it, but that was about it. Well, it turns out that this is more of a boxing movie than a techie robot movie. Although I am not really a fan of boxing, I did enjoy this film, which was centered around the concept of robot boxing. I also found it interesting that Sugar Ray Leonard was the boxing consultant for this movie. The "Real Steel" movie trailer . . . In this film, Hugh Jackman (Wolverine in the X-Men films) plays a talented ex-boxer named Charlie Kenton, who is heavily into the robot boxing world and always seems to owe somebody money. Although Charlie is not a con artist, he is always on the road and thinking about what he can do next to make some money. Even with a longtime friend and somewhat love interest Bailey (played by Evangeline Lilly of ABC's Lost), Charlie just could or would not change his lifestyle. It took the insertion of his estranged 11 year old son (played by Dakota Goyo of Thor) into his life to make Charlie care about being a better person and to put someone else before himself and before money. "Real Steel" still images slideshow . . . Although Charlie has a love interest, this is definitely not a romantic movie. The film does evoke emotion as the movie goes on and this is achieved mostly from the father-son bond that is growing between Charlie and Max. Personally, I think the most moving part of the movie is when Jackman's character fights one last fight. Even though this is a boxing movie more than a techie movie, the robots had a high coolness factor. It was interesting to learn from one of the bonus features that each robot was actually built and not solely computer generated. You can meet several of the robots on the RealSteelMovie Channel on YoutTube, including Atom, Noisy Boy, Metro, Zeus, and more. Another bonus feature I found to be very engaging is the "Making of Metal Valley." To see what it took to put together that short, but extremely exciting part of the movie makes the viewer appreciate all the work that went into the special effects and the execution of the stunts. Video clip from "Making of Metal Valley" . . . In the end, my husband and I enjoyed Real Steel, but we will not be allowing our 8 year old son to watch it. Although there is not too much foul language or graphic violence, there is some violence that is not robot-related. I also think that the Metal Valley scene might be too dark and suspenseful for him. You can pre-order your copy of this film now or purchase it starting on Tuesday (1/24). 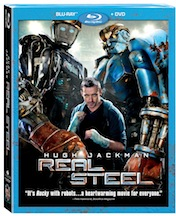 Through 1/19/12, you can snag a $5 off coupon for the Real Steel 3-Disc Combo Pack by visiting www.steelgetsreal.com.